I remember when my daughter Ebony had her classical piano music lessons her teacher, Yelena Kurinets [a great classical music piano teacher], when introducing a new piece, would first play part or the entire piece to my daughter. The first thing she would ask Ebony was to give a description of the piece, i.e., the mood of the piece. She would ask my daughter to state if the piece was happy, playful, fun, exciting, sad, dramatic, scary, or some other descriptive word. She wanted her to learn the mood of the piece in order to know how to play the piece. What later became obvious was that pieces had a certain flavor according to the key of the piece. Pieces that were in a major key, like C-Major, E-Major, etc. were almost always bright happy pieces. Pieces that were in a minor key, like D-minor, E flat-minor, etc., were almost always more dramatic and sometimes darker pieces than those with a major key. The great composers of classical music would put a piece in a certain key to portray the mood they wanted. So, for the most part, if they would want the piece to give a bright, happy feeling to it, they would use a Major key. And for the most part if they wanted a piece to portray a darker and or dramatic mood, they would use a minor key. Note: while a classical music piece is scored in a certain key, sometimes it would change during the piece or in the middle movement of a piece, but almost always the piece will start in the key noted and will end in the key noted. I will give you examples from two of my favorite composers, Wolfgang Amadeus Mozart and Felix Mendelssohn, to show how the key of the piece of music helps determine the mood of the piece. The quintessential classical composer W. A. Mozart, composed 27 piano concertos, most of then truly great piano concertos. You will hear how a Mozart piano concerto in the key of C-Major and one in the key of C-minor have two different moods. Mozart's piano concerto #25 in C-Major displays a bright happy character. The third movement, allegro, displays that mood, aided by it's major key. Then in the second video, in the opening movement of Mozart's piano concerto #24 in C-minor, you will get a completely different flavor. Mozart uses the minor key to portray an undeniable dramatic, serious mood in contrast to the concerto you hear in C-Major. Note: Those familiar with Mozart's C-minor concerto will notice a different cadenza [that begins just before the 11 minute mark] used by the soloist than is usually played. I believe Mozart did not actually write a cadenza for this C-minor concerto and the one usually played is the one that was written by his student, Johann Nepomuk Hummel. I am not sure who wrote the cadenza played in this video. So, Mozart uses the keys of C-Major and C-minor in two different piano concertos to give two very different moods to the concertos. From Felix Mendelssohn, I have two beautiful melodic movements from two of his symphonies, one in a major key and one in a minor key, to demonstrate how the key can help determine the mood of the piece: Symphony #4 in A-Major, known as the "Italian" and his symphony #3 in A-minor, known as the "Scottish". You can hear immediately the playful happy character in the first movement, Allegro vivace, of Mendelssohn's Symphony in A-Major. 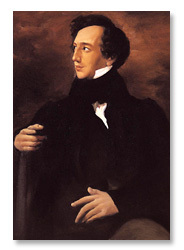 Then from the first movement, Andante con moto - Allegro un poco agitato, of Mendelssohn's Symphony in A-minor you will notice a complete different mood, one of drama, thoughtfulness and seriousness. Both of these symphonies are representative of the beautiful melodic nature that all of Mendelssohn's works contain, but with a different mood that their keys help to develop. As I say always, please turn up the volume and enjoy this great music from Mozart and Mendelssohn with two of the pieces in major keys and two in minor keys and hear how the keys are the key to the mood.